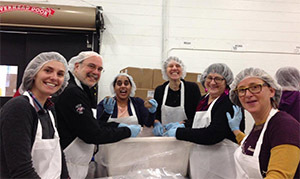 DFMCH faculty and staff volunteer at the first Days of Service activity on Mon, Jan 18, 2016, at the Second Harvest Food Bank. The DFMCH held the first Days of Service activity on Monday, January 18, 2016, at the Second Harvest Food Bank. In three hours, DFMCH faculty and staff volunteers packaged over 10,000 pounds of turkey sausage patties for the largest food bank in southwestern Wisconsin. They had a great time working together, and their efforts helped people throughout the region get enough food to live healthy lives. The DFMCH is planning several more Days of Service in the coming months. These include a household item donation drive for the YWCA, and outdoor cleanup at the Ice Age Trail and the University of Wisconsin Arboretum. All of these events recognize our name change to a department of family medicine and community health, and celebrate our recent 45th anniversary. Please consider volunteering for one of these fun community service opportunities. You can sign up online at http://www.fammed.wisc.edu/contact/service-days/.